Newer Craftsman home for sale in Grant Park! 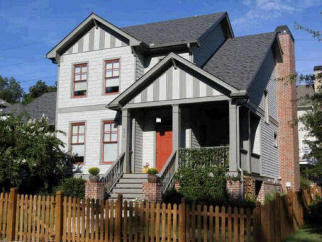 Don't let this Grant Park home pass you by! Now is your chance to invest in the future of Atlanta's park, trails, and transit with this location along the Atlanta BeltLine - hence, this is one of our recommended BeltLine Best Buys! Interior Features Superbly maintained newer Craftsman home located in Grant Park! The open floor plan is wonderful for entertaining, with a family great room centered around a fireplace and open to the kitchen with granite counters and stainless steel appliances! A butler's pantry connects the kitchen to the formal dining room with tray ceilings and wainscoting! Hardwood floors throughout living areas! Upstairs, the master bedroom showcases high, coffered ceilings, and a walk-in closet! Master bath has dual vanities and separate tub and shower! Large bedrooms and high ceilings! Laundry conveniently located on second level! Exterior Features Located within walking distance to the Atlanta BeltLine and Zoo Atlanta, this Grant Park home is situated perfectly in one of Atlanta's historically significant neighborhoods. Mature trees canopy the streets and parks dot the area. You will love relaxing on your back porch within your fenced back yard with one-car carport. Your picket fence and covered front porch welcome you home! Additional Features and Amenities Built in 2005 on a cul-de-sac street offering safety and privacy!